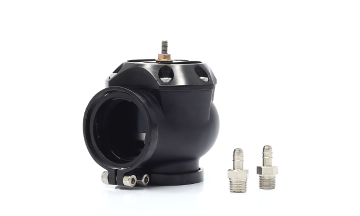 Synchronic DV is the first, truly compact, zero-diaphragm, high-flow Diverter Valve with a blistering actuation time measured at 25 milliseconds. Mass air flow (MAF) and speed density (MAP) applications can apply the new design in push or pull orientation with the ability to fully re-circulate or vent-to-atmosphere the valves discharge. Construction is based on near-net investment casting of aerospace-grade Aluminum for the body, followed by post-process CNC machining of all components including the forged billet 6061 actuator assembly. A complete selection of available mounting flanges are interchangeable between the SB and DV series and users can either upgrade from an existing BOV/DV by simply bolting on an adapter or weld on to a new project using the Aluminum or Stainless weld flanges. Boost/vacuum connections are made via 1/8th NPT threaded bosses that accept either Boost Connect or included nickel-plated-brass barb fittings. Each assembly is pressure tested to withstand 60 psi and positive lock clamshell retainers are included with each assembly for fitment.